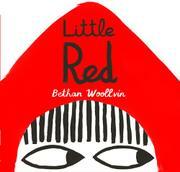 Little Red gets a bold look and attitude while the wolf gets his comeuppance. The text starts off traditionally enough, with Little Red’s mother sending her into the woods with cake for her ailing grandmother, but the graphic art style portends innovation. Throughout, striking black and gray images deftly occupy the white of the page, with red as a vibrant highlight. When the red-cloaked girl encounters the wolf, she’s unafraid, but in keeping with tradition, she tells him about her grandmother. Alas, this doesn’t end well for Grandma, whom the wolf devours as one toothsome bite. When Little Red arrives after the fact, she peeks inside to see a “badly disguised wolf.” Upon entering, she plays along, casting a withering side eye as she rattles off “what big […] you have!” lines. The gullible wolf lunges at her with the familiar cry: “All the better to… / …EAT YOU WITH!” But Little Red has a little secret: she holds an ax (no need for a burly woodcutter to swoop in and rescue her), and after a double-page spread extreme close-up of her magnificent eyes, the next spread depicts her sporting a wolf-skin, much as Roald Dahl’s Little Red does in Revolting Rhymes (1982). It’s a satisfying ending for Little Red, yet Grandma remains unmentioned and…dead.